Published by The Writers Trust, 2015. This is a lovely little book and it showed me that I am not alone, and neither is my mother. The Broth of Oblivion is told in just the way care-givers have to think – in short bursts. There is so much here that my sister and I have gone through with our mother. The tears, the frustrations, the anger, the never-ending suffering, and the bursts of sunshine and occasional good day. I’ve passed the book on to my sister and hope she gets as much from it as I did. Thank you, Brian Morgan, for reliving your caring days with your mother, and especially thank you for your ending, which was beautiful and uplifting. This is the story of a man who finally lost his mother on All Saints Day, after a long battle with Alzheimer’s disease. It is very well written and will surely be a comfort to many who care for those with dementia or simply old age. It was certainly a comfort to me and my wife. My mother had more anger than Brian Morgan’s mum seemed to have, or maybe he chose to leave that out. But everything else in the book mirrored what we went through in our case. My wife cried at the ending, but it left her with beautiful thoughts. For this alone, Brian Morgan, I thank you. 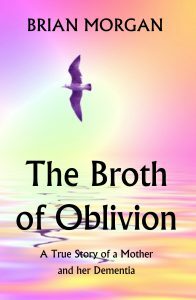 The Broth of Oblivion is a small book packed with insights and stories from a mother’s battle with Alzheimer’s. It helps that it was written by an acclaimed writer, but the little glimpses of private lives is what will endear this book to readers – especially those who care for dementia patients. It’s a lovely little book, written with sensitivity and honesty. We are left to ponder the gift of memory – the treasure it is to have and the devastation it is to lose. If you care for someone, or know someone who does, The Broth of Oblivion would make a wonderful little gift, when there is nothing we can usually do for others in this situation. I highly recommend it. We have to tell you that we found this little book delightful. It was full of sadness and frustration and all the rest we suffer with our lived ones, but it showed that Brian Morgan had the understanding and the sensitive soul needed to help others. We did chuckle in places when we thought of similar things that happened with our mother, but we also felt a kind of relief that we were not alone and that we should not carry guilt for what we could not control. Brian Morgan, we are so grateful to you for opening your old wounds to help others. We suspect that it might have been therapeutic for you as well, and this has inspired us to jot down our thoughts and feelings as we continue our journey. Thank you. Like to return from The Broth of Oblivion reviews to the Published Books page?